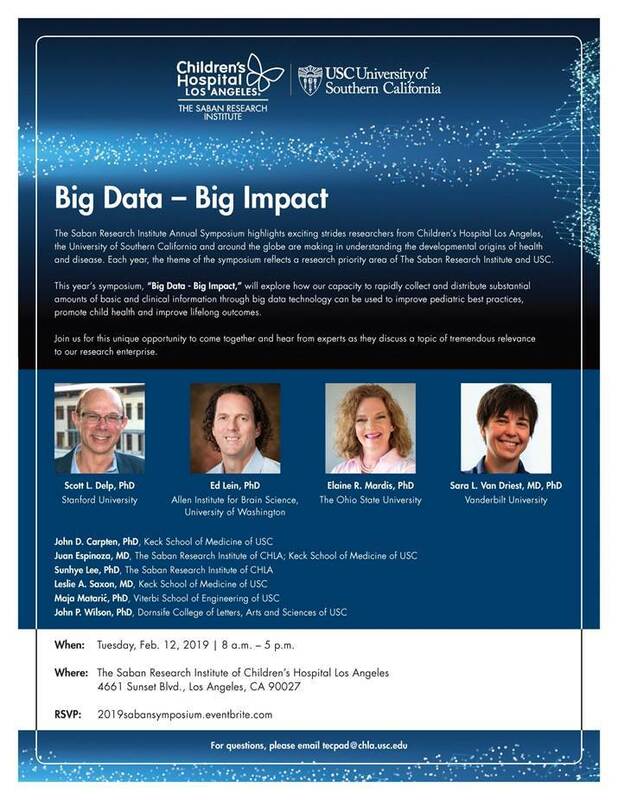 This year’s symposium, “Big Data - Big Impact” will explore how our capacity to rapidly collect and distribute substantial amounts of basic and clinical information through big data technology can be used to improve pediatric best practices, promote child health and improve lifelong outcomes. The Saban Research Institute Annual Symposium highlights exciting strides researchers from Children’s Hospital Los Angeles, the University of Southern California, and around the globe are making in understanding the developmental origins of health and disease. Each year, the theme of the symposium reflects a research priority area of The Saban Research Institute and USC. Join us for this unique opportunity to come together and hear from experts as they discuss a topic of tremendous relevance to our research enterprise. Click here or on the image below to RSVP. This event is hosted by The Saban Research Institute of CHLA.